The subject of today’s post is a man best known for his work as a Hollywood actor. His autobiography, The Wanderer, is a an excellent reminder that the public persona of celebrities, good or bad, probably bears little resemblance to who these people really are. In the book, a very complex man is revealed: He captained an America’s Cup yacht to victory before he was 25; sailed to Tahiti and became engaged to a princess; in WWII he was an OSS agent fighting with the Partisans in Yugoslavia; he is in films like Dr. Strangelove and The Godfather, but detests acting and Hollywood; he is a harsh critic of himself and others, yet has great respect for the common man; above all else, Hayden is an adventurer who rejects everything that consumer society tells him he must do. Hayden’s commentary on the last subject is well worth considering in great detail. His lifelong love was sailing, not flying, but his words ring true for any airplane builder. Hayden made and spent several fortunes, but never found himself short of great friends. They were all attracted to his personal code of living life as an adventure, on his own terms. Above, Sterling Hayden in his Arena, circa 1950. The walls inside our home are lined with bookshelves. They contain many volumes that I found personally moving. But the very first time I read Hayden’s quote above, it hit me like a lightning bolt, directly reaching my strongest, but unspoken, dreams and fears. There are things I feel I must do in life, planes I wish to build and places to fly them to. Hayden plainly states that dreams and adventure are the core of a life worth leading, and he identifies consumer society as the mortal enemy of any man’s dreams of adventure. The fact that the man wrote “But we are brainwashed by our economic system until we end up in a tomb beneath a pyramid of time payments, mortgages, preposterous gadgetry, playthings that divert our attention for the sheer idiocy of the charade” in 1962 gives you a good idea of how far ahead of the power curve he was. It also makes you realize that if he was alive today he would have an aneurism thinking about how little people heeded his warning, and how little most people are willing to get out of life. Read the words about cruising vs. voyaging: We have all seen some super wealthy guy dump a ton of money into a plane, and fly the plane to Oshkosh in search of recognition in the form of a trophy. This is the predictable cruise that Hayden speaks of. An expenditure without passion and a predictable result without meaning. Now picture a guy who feels like he must build a plane, but doesn’t know if he can find the money to complete it, yet he starts anyway because he is unwilling to abandon his dreams. The budget forces him to learn and to be resourceful. He must make things with his hands. He may not know how to fly when he starts building, but he is committed to the belief that he will meet this challenge. This is the voyage that Hayden is speaking of. Replace the word Seaman with Aviator, and it fits right into place. By choosing to build your own plane, accepting and managing the risk, you are making a giant course correction from a life consigned to “the cancerous discipline of security.” The next time you tell someone that you are building your own aircraft, and the first thing out of their mouth is something about how they would never build one nor fly with you, just think of Hayden writing: “In the worship of security we fling our lives beneath the wheels of routine – and before we know it our lives are gone.” That is what is going to happen to all the people with a long personal list of things they would never do. If you are persistent in pursuit of your dreams, your place isn’t going to be among those who expended their lives relentlessly looking for security. If the goal of the captain was to preserve the ship, he would never leave port. Most people never do. The goal of the captain is to seek adventure, to meet all the challenges and still achieve the goals, to be In The Arena, not rusting at the pier in the safe harbor. Make your choice. If it sounds scary, it’s because consumer society has had decades to teach you to doubt yourself, your potential, your dreams and abilities. Building a plane and learning to master it is the rejection of these messages, and the replacement of them with the knowledge that you are the master of your own adventure. Above Sterling Hayden plays “General Jack Ripper,” the mad SAC wing commander in 1964’s Dr. Strangelove, Kubrick’s black comedy about nuclear war. The character was patterned after General Curtis LeMay. Beside him is Peter Sellers playing Group Captain Mandrake. 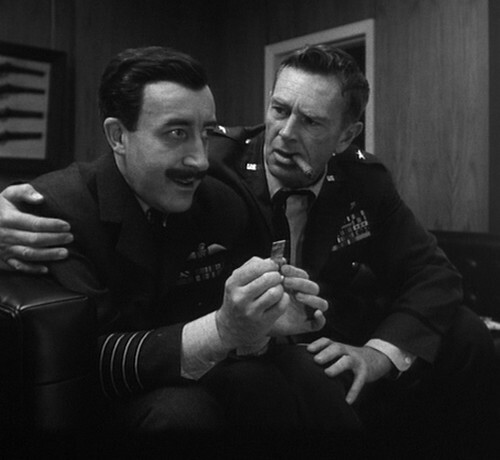 Sellers also played president Merkin and Dr. Strangelove. The film is a masterpiece; I have seen it about 20 times. In it, Hayden is being interviewed in NYC in 1980. He has just returned from attending Marshal Joseph Tito’s funeral in Yugoslavia. He is 64 years old in the interview, yet he is full of life. Johnny Depp said that he made up the whole pirate Jack Sparrow character based on watching films of Keith Richards. Looking at the interview, it is easy to imagine Richards styling his personal image after Sterling Hayden. You don’t have to develop the look of a pirate to emulate their quest for adventure.